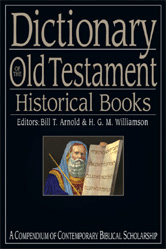 Editors: Arnold, Bill T. and Williamson, H. G. M.
The history of Israel forms the skeletal structure of the Old Testament. Understanding this history and the biblical books that trace it is essential to comprehending the Bible. The Dictionary of the Old Testament: Historical Books is the only reference book focused exclusively on these biblical books and the history of Israel.